LARGE PRICE REDUCTION! WALK INTO EQUITY! Beautiful 4 bed, 3 bath home on PREMIUM LOT BACKING GORGEOUS TREED OPEN SPACE! Hardwood flrs on most of main level. Living room w/ built-ins. Wonderful kitchen boasting large island, pantry, 42" cabinets & SS appliances w/ double ovens. Family room w/ tiled gas fireplace & mantle. Private main floor study. Upstairs are 3 secondary bedrooms & a full bath w/ double sinks. 2nd level laundry comes w/ gas or electric dryer hook up & utility sink. Awesome loft area w/ theatre system to stay, surround sound, projector, screen, remote controlled dimming lights & black out curtains. Master bedroom attached to a 5 piece upgraded tile master bath & walk-in closet. The walkout basement has a storage room w/ built-in shelves. The rest of the basement has gym flooring throughout. The quiet backyard features a trex deck, large stamped concrete patio & backs to incredible open space. Zoned furnace & A/C. 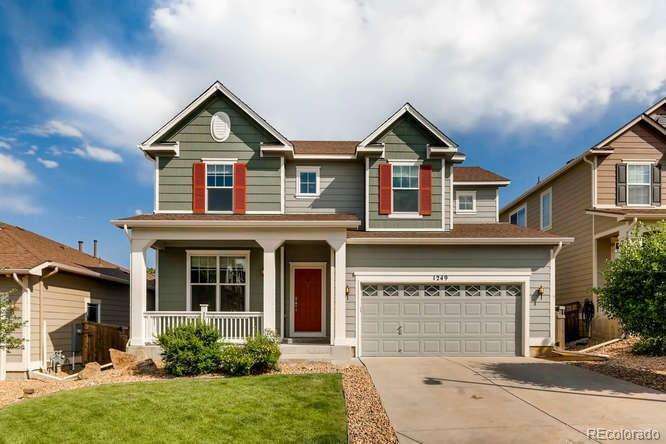 Close to schools, parks, trails, shopping & I-25.